Hydrocarbon-savvy ASX investors take note. A $6m capped onshore oil and gas producer with over 2,000 active US wells producing around 600 Bbl/d and 6,100 Mcf/d, sporting a US$200MN Macquarie-sponsored credit facility is beginning to emerge. While its wells in the US involve low risk development plays that produce oil and gas from conventional, long lived assets, and generate continuous cash flow, the more interesting play here is in our own backyard. Before his death earlier this year, McClendon announced that his American Energy Partners (AEP) had completed four transactions in the McArthur Basin – and one deal was cut with this ASX stock. McClendon sealed a Definitive Farmout Agreement with this company, to the value of US$75M, with an additional US$100M as part of a Stage 2 funding. 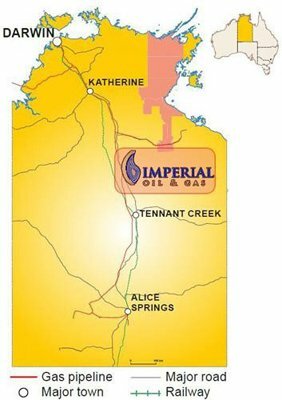 This covered our company’s 14.6 million net acres of property at its McArthur Basin Project, which holds a potential resource P(50) unrisked of 1,846 MMBoe (billion barrels of oil equivalent) or 11Tcfe, over a 3.5 million acre tract of the wider land parcel. What did the man, commonly referred to as the “US shale king” see in this ASX stock’s onshore acreage across the Northern Territory of Australia? 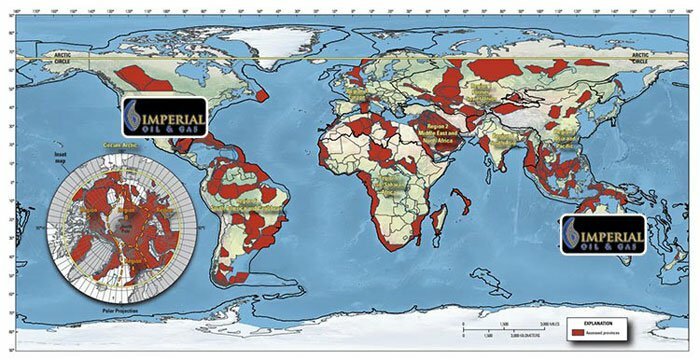 With favourable geology that if expertly stimulated, could unleash a global scale shale gas project on par with some of the big US shale plays. The untimely death of McClendon has seen a deferment of the closure of the farm out agreement as the results of the August NT election are awaited. With fracking a hot election issue, both companies are eagerly awaiting the result of this election. The thing is – the geology of this ASX company’s ground has not changed amongst all this. Like all oil stocks of this size, this is not for the feint hearted, and is a speculative investment. Cash appears quite tight right now. There is no guarantee of success here, so seek professional investment advice if considering an investment. Today’s company has the location and is working with McClendon’s very experienced exploration and development team – whose members have drilled and completed thousands of unconventional wells throughout the major shale basins of the USA. Despite the controversy that surrounded Mr. McClendon, this company also has the knowledge that before his passing, the shale king expected big things from outback Australia. The oil game is far from over — some may even suggest it is beginning again with recent rebounds in prices. The emphatic slide in oil prices in recent years blew hundreds of operators, producers and explorers off the global oil chess board, and at the same time presented dozens of strong-assets at knock-down prices for savvy oil operators. 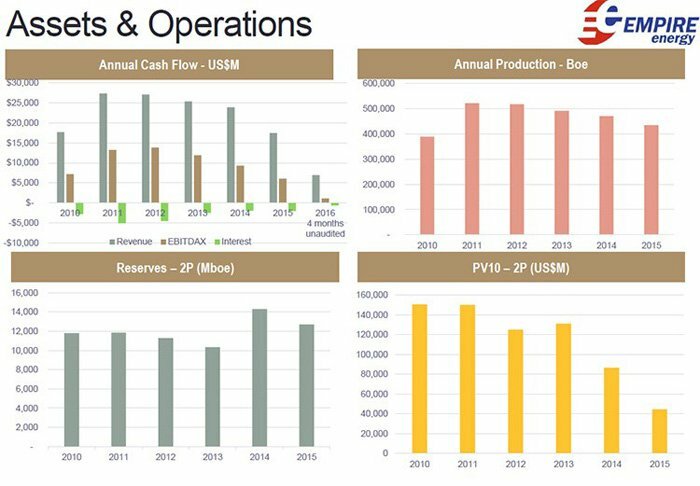 Already an active E&P (exploration and production) company operating over 2,000 wells in its possession, and with revenues of almost $US4 million in Q1 2016, and an EBITDA of US$2.1 million, EEG is one US-based oil company that’s actually making money (albeit paying back debt) in current conditions. With 216,000 gross barrels of oil and 2,222,000Mcf of gross gas produced and sold in 2015 from EEG’s US operations, you would have thought this company would be worth more than AU$6 million. It’s likely that the market may be discounting this stock due to the debt it has been studiously paying off, a weak oil price, and waiting for political events to run their course. EEG is on course to pick up the fracking-baton from one of the most famous personalities in the hydrocarbon industry, to finish what he started — cracking the code of the McArthur Basin shale in the Northern Territory of Australia. This company has a growing production portfolio in the US, a potential company making asset to explore in the McArthur Basin, so it may not be long before its current valuation starts an upward ascent. Prime factors for sorting the wheat from the chaff amongst onshore oil producers is production cost, production location and production capacity. ...by expanding its onshore shale ambitions into Australia’s Northern Territory — a region with highly prospective shale plays, but which remains behind the curve with little onshore exploration activity to date. Should the Labour Party win the Northern Territory election in August, they will review fracking regulations . The Party says it supports fracking, but will call a moratorium due to environmental concerns. The ruling Country Liberals view is that the method is safe and economically vital. It is a hot election issue and does pose some risk to an industry that will now need to show that the risk of environmental damage is “as low as reasonably practicable”. 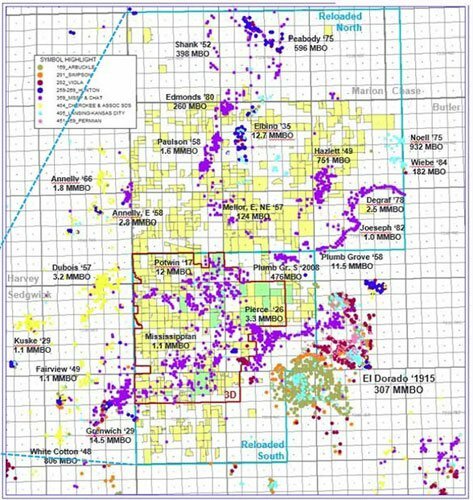 Given the technical exploration team behind EEG has proven its mettle on hundreds of wells in the US, as part of the highly acclaimed US shale gale, and McClendon’s AEP was willing to invest hundreds of millions into NT shale, via EEG, then perhaps the NT political issues may not be insurmountable. Geoff Hokin who has 12 years’ experience as a geologist in the unconventional coal and gas sectors in Australia. As you can see this is an experienced team with invaluable on-ground experience, all housed in a micro-cap $6 million ASX stock. Now could be a good time to back these fracking-connoisseurs at rather bargain-basement valuations and with the neat bonus of this company having a bulky US$200M (AU$268M) capital line on offer from Macquarie Bank, currently drawn to US$40M. This means future asset acquisitions, exploration changes and project logistics could all be handled quickly. At the same time, there is no guarantee that the company will draw on the credit line only to fund expansion, and like all small oilers, EEG may need to raise capital at some stage to fund its expansion – this is a speculative investment. Investors should seek professional investment advice if considering an investment. The people who are struggling the most are inefficient oilers producing oil at $60+ per barrel. As the tide of the 2010-2014 oil boom receded, dozens of US-based oil companies were left naked, with inefficiencies cruelly exposed. The oil slide has erased $1 Trillion from the valuations of US energy companies, (according to the Dow Jones US Oil & Gas Index ) which surpasses the $883BN peak-to-trough loss in market capitalisation seen after the dotcom bust in the early 2000’s. In such staggering market conditions, how is an oiler supposed to put bread on the table? The simple answer is efficiency. When oil prices are under $100/barrel, even the less efficient players are able to succeed. When oil prices are <$50/barrel, it tends to be only those with belts tightened, that survive. For EEG, the current oil market is therefore abound with opportunity because its own cost-structure remains well-below current market prices. EEG operates in two different countries, with assets scattered across the US (over 2,000 wells in 3 states) and the rather large McArthur Project in Australia. In total, EEG owns almost 15 million acres of exploration ground, with the vast majority in the Northern Territory of Australia, as part of the McArthur Basin, which is thought to hold at least 240Tcf of potentially recoverable gas resources overall. The area shaded red, indicates the entirety of EEG’s tenements, stretching to 14.6 million acres. That’s about the same size as Norway. 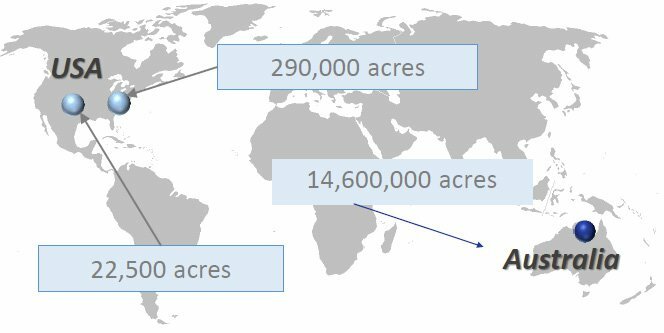 As you can see, EEG’s Australian acreage rivals the size of several US states and is around 20% of the total Marcellus play. Given the size of the McArthur Project, EEG was always in the market for a joint-venture (JV) deal with a major to achieve explorative progress. Aubrey McClendon was a visionary who today’s non-conventional oilers should be profusely thanking. It was Mr. McClendon whose push into shale drilling revolutionised the global energy business — and made himself a billionaire in the process, in tandem with crowning Chesapeake Energy (NYSE:CHK) as the 2 nd largest gas producer and 7 th largest oil producer in the US. His rise was the stuff of legend. His entire oil strategy was not only to champion controversial hydraulic fracturing — but to go one step further by making it work with a high degree of probability. Mr. McClendon grew to become a towering figure by building Chesapeake into a US$37.5BN powerhouse (after co-founding it in 1989). He then founded American Energy Partners (AEP) in 2013, raised over US$10BN, and amassed an arsenal of oil & gas assets across the US, Australia and Argentina. 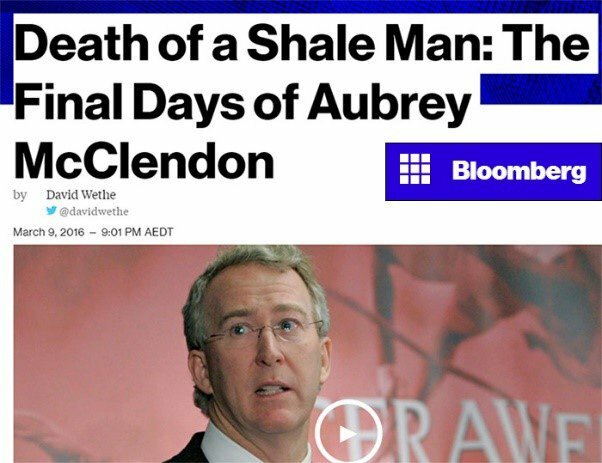 Aubrey McClendon’s untimely death was a massive shock to the entire US oil industry, because of his illustrious past and broad involvement with the local community. For nearly a week following his death, flags flew at half-mast at banks, churches and energy businesses across Oklahoma. Stores near the Chesapeake campus closed so employees could attend the funeral, which was held in a mega-church and drew a standing-room crowd of more than 3000. If there is such a thing as a celebrity oiler with gravitational chutzpah, Mr. McClendon was it. Mr. McClendon was also a key element in conjuring up the shale gale in the first place, via improved fracking and extraction techniques. Many oil-sector executives and analysts dubbed him the ‘Steve Jobs of Energy’, for his foresight and early-market moves that led to consistent success in shale exploration. The connection with EEG is that back in 2014/15, Mr. McClendon singled out the McArthur Basin as potentially the most prolific oil and gas producing region for the coming 50-100 years, based on initial geophysical data and current understanding of unconventional drilling techniques. 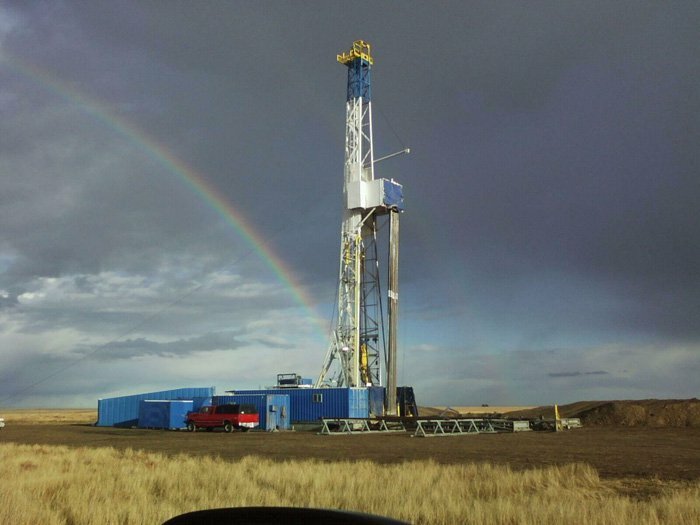 For some oilers, every well is a completely 50/50 affair, based simply on geological surveys. For others, wells are targeted based on specific understanding of the accompanying data such as porosity, the type of rock, compositions of shale formations and many others. Aubrey McClendon had both a vision and a formula — for how to identify and access huge shale resources that were previously unreachable. In other words, he was able to figuratively ‘fingerprint’ various projects and improve the strike rate when spudding new wells — without the huge expenses typically associated with drilling. As a result of his passing, the Farmout deal between EEG and AEP is caught up in the McClendon Estate, which leaves EEG with both a challenge and an opportunity. The challenge for EEG is to find a new JV partner that can assume AEP’s position if it doesn’t continue, and to do it as quickly as possible. The opportunity is for EEG to take its stature to the next level, by securing a large oil and gas resource. The estimated Prospective Resource P(50) is 1.85 billion Boe or 4.3 billion Boe in the P(10) category. Given the preliminary results, for early commercialisation EEG is focusing its attention on Velkerri Formation (shown in pink below), however the major resource target for EEG is the Barney Creek Formation — a formation in the McArthur Basin which has delivered commercial quantities of natural gas in wells drilled to date. The location wasn’t picked by chance — EEG has identified this lower portion of its 14.6 million acre McArthur Project plot, as having significant short term potential. Aubrey McClendon was quoted as saying that, “The Tanumbirini #1 well is the best shale well I have ever seen”. Coming from a veteran US oil man, that should inspire confidence amongst exploration crews in the region, and it’s no surprise Santos are concentrating a significant portion of their exploration close to Tanumbirini #1. 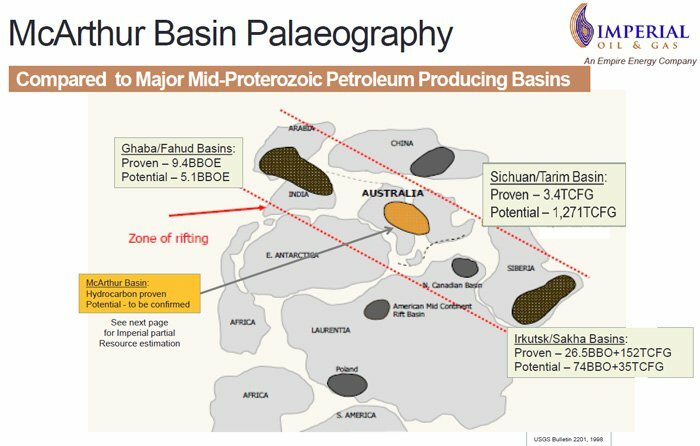 EEG’s McArthur Basin Project is also sitting on what’s known as a ‘depositional basin’, where the shales were originally formed, with EEG right on top the ‘depo-centre’ — considered as a likely ‘sweet-spot’ if compared and contrasted to other shale formations and their composition. Further exploration should make this official, but the early signs are good. 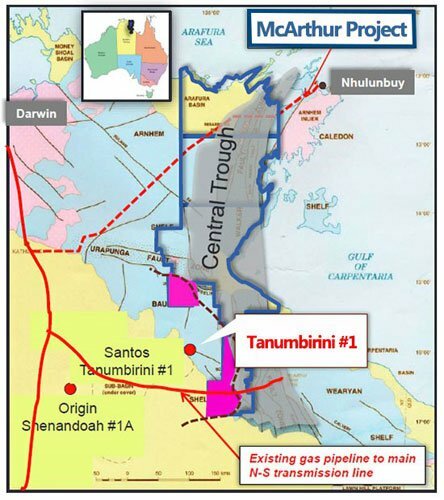 Assuming EEG can open its petroleum tap in the McArthur Basin, the existing pipeline towards the north (Darwin and its two LNG plants which require gas) and in the future to the east (Jemena pipeline approved, but to be built) could be supplying gas to the Gladstone LNG plants, at just the right time for an Asian peak in demand. 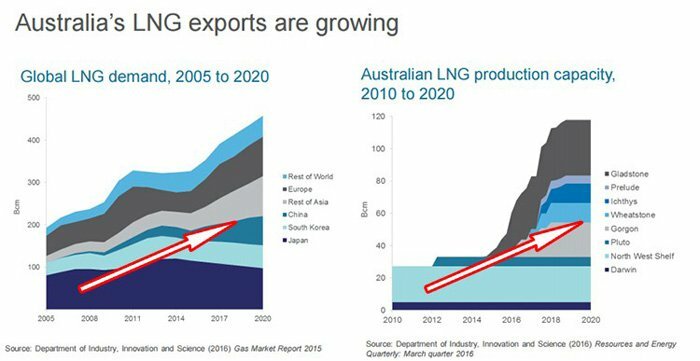 Australian exports of liquefied natural gas (LNG) are expected to pick up substantially as a number of large-scale LNG projects scale up production over the next few years. LNG is expected to become Australia’s second largest commodity export (after iron ore) by 2018, with the bulk of these exports destined for Asian markets. 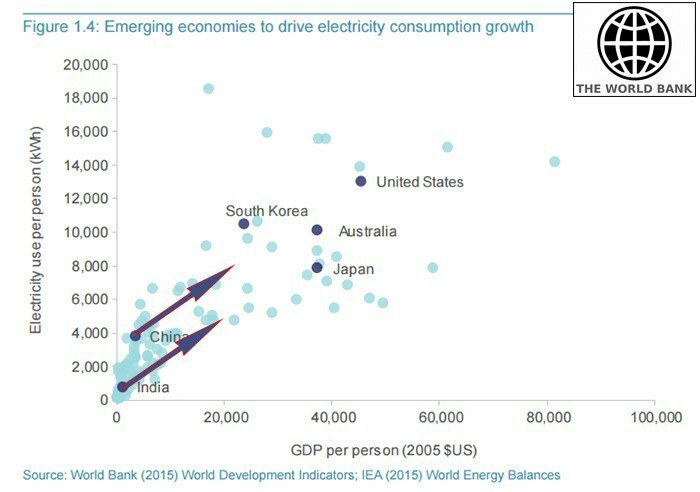 That’s exactly where EEG wants to be at some stage — supplying the next phase of Asia’s insatiable growth spurt, which clearly has a while to go if looking at electricity consumption as the barometer. Shale gas constituted only 1% of total US natural gas supply in 2000, but today, it is almost 67% of total US production. The American Dream is the famous adage that with grit and perseverance, anyone’s ambitions can become a reality— with creature comforts thrown in for good measure. 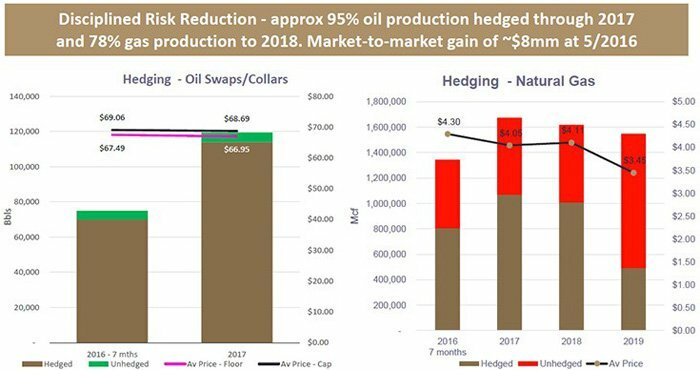 At EEG, its US operations have most certainly stood out with positive cash flow and EBITDA generated on the back of hyper-efficient production and intelligent hedging using financial derivatives. In the US, EEG is an Operator of Mid-Con & Appalachia assets with current net production of around 1,300Boe/d. EEG possesses over 2,000 wells scattered across the US, all of which have been kept in good working condition . Here is an overarching snapshot of EEG’s performance since 2010. As you can see, this plucky oiler has put forth positive cash flow, strong annual production, maintained a 2P Reserve above 12,000Mboe and positive NPV in every year since 2010. If EEG can maintain positive traction in an oil market downturn, what could it do when the oil market reverts back to boom-mode? Here at The Next Oil Rush , we’re more than keen to find out. EEG is clearly a company that is bucking the trend of oilers falling like flies across the US. 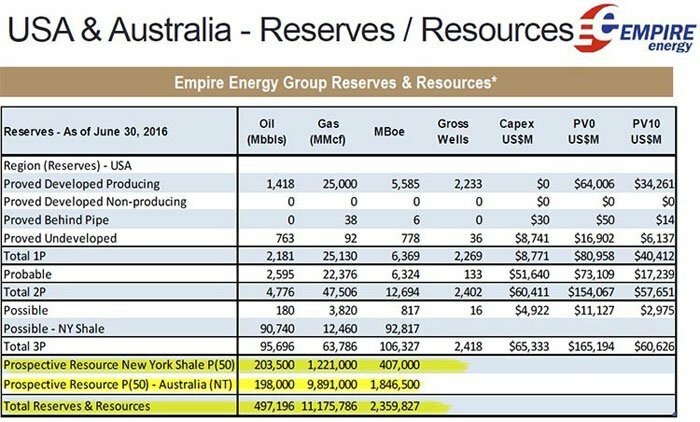 And if we take a look at its US-based reserves, and added to the Australian-based blue sky potential, EEG could be one of the best onshore shale prospects over the coming years. The total Proved Reserves and Prospective Resource for both EEG’s oil and gas prospects is 2,359,827Mboe. That’s a pretty staggering figure which will require EEG to do further exploration, however, its past expertise and involvement with AEP, suggests to us that this potential has been somewhat de-risked in favour of EEG. One particular US asset most definitely worthy of note that hasn’t been mentioned yet, is EEG’s Butler County asset located in Kansas. EEG targeted this asset in mid-2015 and has initiated a buy-in schedule which could see EEG acquire up to a 60% stake in the short term. Butler County is a 70,500 acre asset with 30 new target fields identified from a recent 3D survey. Butler County is important because it allows EEG to re-stock its US portfolio with prolific wells, in order to replace those with falling pressures and production rates. Drilling risk is low and if there are dry wells they are of negligible cost. Going out hunting for multi Tcf gas resources in Australia is a great thing, but it also pays to butter the bread that fed you for over seven years too. As the saying goes “the easiest way to find oil is to drill within a known oilfield”. Kay County is a 10,000 acre asset where EEG has a 50% stake. Here too, EEG is pencilling in some strong project economics, with a 2P net reserve of around 5MMBoe and a net 2P PV10 of US$27MN. The ability of oil prices to remain elevated has clear repercussions on oilers. However, there are ways to take price fluctuations largely out of the equation. Through timely futures contracts taken out while oil prices were high, EEG has effectively insured itself against the sudden decline of oil prices, to the delight of its shareholders. 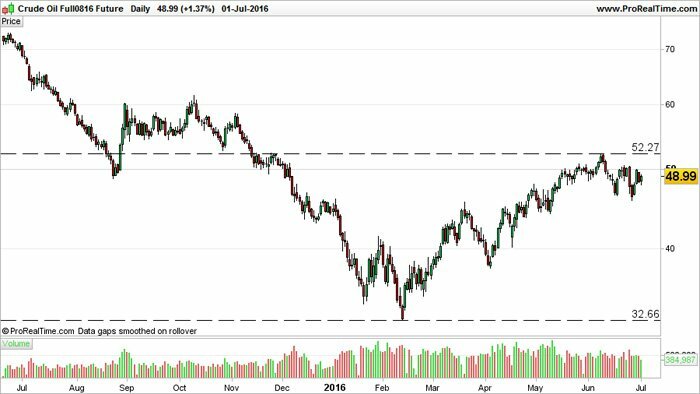 This smart move has helped EEG weather the oil price downturn, and continues to support financing to this day. 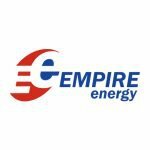 Last but not least on EEG’s asset list, is recently acquired 1bcf worth of operational wells spread across 30,000 acres in NY State. The payback on this asset is estimated to be around 9 months — an excellent timeline that’s below industry averages — with more news likely on the horizon over the coming weeks and months. This brings EEG’s total landholding in New York State to around 300,000 acres. Most of this land covers potential Marcellus and Utica shale potential, which unfortunately is stuck in limbo due to Governor Cuomo’s fracking ban in New York State. Marcellus and Utica acreage in Pennsylvania, to the south of New York State, sells for between US$2,000 to US$15,000/acre. Hopefully, EEG will be able to cast some price catalysts in the direction of shareholders later this year. EEG is a conventional oil producer with the most unconventional of ambitions. With the oil market summersaulting here, there and everywhere in recent years, EEG has stood out as a fixed bellwether representing what can be done with oil, when efficiency is at the heart of operations. With its US turf assimilated, EEG is a small-but-growing fish that’s ready for the bigger oceans of unconventional onshore shale exploration. It has the opportunity to become the world’s first E&P Company dedicated to commercialising the McArthur Basin – a mammoth unconventional resource, and with backing from both Macquarie and one of the original catalysts for the US shale gale, Aubrey McClendon. with an eye on growth and expansion into the larger oceans of unconventional onshore shale. That’s more than could be said for some of the other US-based oilers, who’ve collectively seen bankruptcy rates skyrocket since 2014. At the same time, EEG is a small oil company, and is a speculative investment. There is no guarantee of success, and caution should be applied if considering an investment. The fact that EEG has remained resolute and productive — while so many have fallen by the wayside — suggests that we may have stumbled upon a needle in a haystack. ...and we think EEG may have everything in place to make it happen. Could EEG be Sitting on 2 Billion Barrels of Oil Equivalent?